Mimpeiyaki, or Mimpei ware, is a type of pottery established in the late Edo era, around 1830. Gorgeous, colorful and distinctive, they were created by single Japanese potter by the name of Mimpei Kasyu, the village headman of Igano mura, a small town in the southernmost part of Awaji island, located in the Inland Sea, west of Osaka. His family was in the shoyu (soy sauce) trade, but his talent and ambition led Mimpei to leave the family business to become a potter at the age of 33. 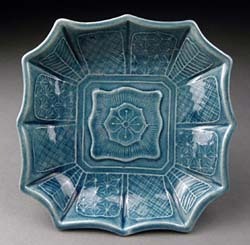 After inviting Ogata Shuhei to his kiln to introduce the techniques of Kyoyaki (Kyoto ware), he soon developed his own style which was influenced by contemporary potters of the day such as Eiraku Hozen and Shuhei’s older brother, Ninnami Dohachi. Also inspired by classic Chinese pottery, he created delicate porcelain ware decorated in exquisite and intricate three-dimensional designs that included animals, human forms, floral and geometric motifs. These were overglazed with polychrome enamels in classic Chinese colors (blue, celadon, bright green, yellow and gold) so that the design was highlighted and enhanced, pooling randomly in varying levels of intensity. Mimpei was quite successful and prolific, and his pottery was popular and widely traded in its time. Dishes have been excavated in large cities like Tokyo (then Edo), Kyoto and Osaka, and as far away as Aomori (in northern Japan) and Okinawa (the southernmost island). Because of their intense color and glowing, stained-glass like effect, these jewel-like dishes are particularly attractive in small sizes, and kozara, especially in small sizes, are much sought after. Some people find mimpei yaki too intense in large doses. We started adding mimpei kozara to our table a few years ago. Mimpei kozara are fun to use for tsukemono, a peice of wagashi, or a dab of chinmi. I like to mix a few colors together, and sometimes put a mimpei kozara on top of a larger ceramic or lacquer plate to set it off. Mimpei has only recently come into popularity, so it's still easy to find the occasional bargain. Average prices are anywhere from 2,000 to 6,000 yen. 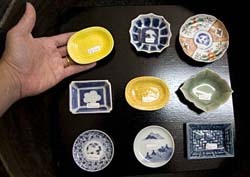 Small peices are generally more expensive than medium or large peices, and some rare colors, like lemon-yellow, are quite pricey: Expect to pay over 7,000 yen per plate. We have a limited supply of mimpei pieces in our gallery, Mizuya. Mimpei pottery features strong, bright colors and Chinese-inspired raised designs. The effect is a little like stained glass. Mimpei kozara are especially appreciated for their jewel-like colors. A few well-places dishes brighten the Japanese table.